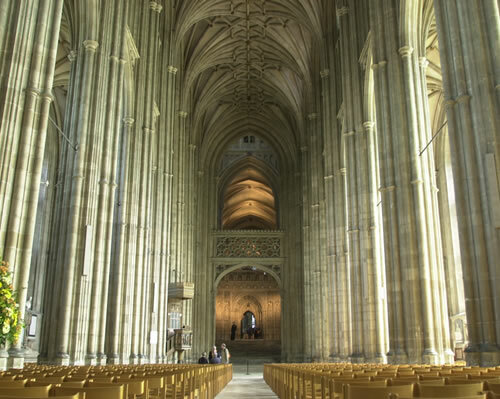 Canterbury Cathedral forms one third of Canterbury’s UNESCO World Heritage Site. From the conversion of the Anglo-Saxons of Kent to Christianity in 597 and the proclamation of the first Archbishop of Canterbury, it was at the core of religious life and many political disputes with the Crown. In 1170 the infamous murder of Thomas Becket took place here. The accession of Stephen Langton as Archbishop of Canterbury in 1207 brought church-state tensions to a head. Langton became an implacable opponent of King John and joined with rebellious barons and other bishops to limit the royal powers. This led directly to the showdown that produced Magna Carta. Langton’s input to the charter is emphasised by the first clause, which protects the freedom, rights and liberties of the English church.